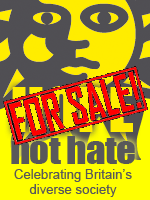 Fake charity Hope not Hate are selling an anti-UKIP leaflet marketed at trade unionists as part of their trade union funded political campaign against UKIP. The leaflet comes a year after Hope not Hate asked readers of their UKIP attack blog if the supposed anti-fascist organisation should target UKIP even though the party isn't fascist and concluded that there was no mandate to do so. According to their accounts lodged with the Electoral Commission, tax dodging Hope not Hate is funded almost entirely by trade unions with most of their big donations coming at election times for political campaigning. Earlier this month Hope not Hate sent out an email begging for money to pay for their anti-UKIP campaign. Presumably there wasn't enough money left from the donations after paying Nick Lowles' salary because they're charging prospective pedlars of hate £20 +P&P for 1,000 copies of their propaganda leaflet.